With some leftover bolognaise sauce and a bunch of fresh spinach growing in the garden, cannelloni seemed to be the obvious choice for last night’s dinner. It would be quite a marathon to produce this meal from scratch, but it’s the sort of thing that’s easy to assemble in stages. I made the pasta in the morning and left it to rest in the fridge while I filled the paddling pool for the girls. In between mopping up their dripping footsteps on the kitchen floor and handing out cups of apple juice, I managed to mix the filling for the cannelloni – finely chopped fresh spinach, a tub of ricotta, freshly ground black pepper, a teaspoon each of dried parsley, basil and oregano, a handful of grated Parmesan, a dash of grated nutmeg and an egg to bind it all together. This too went to ‘rest’ in the fridge beside the pasta dough. 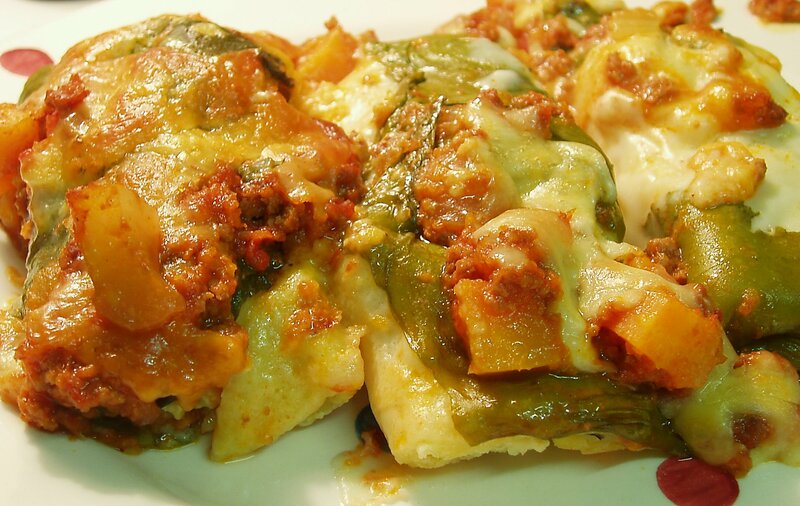 … a small amount of bolognaise sauce covering the bottom of the dish, eight cannelloni tubes of freshly-made pasta filled with spinach and ricotta nestling together, a pouring of bechamel sauce, a cover of large, homegrown spinach leaves, the remaining bolognaise sauce spooned over the top and a final sprinkling of grated mozzarella.